Image Size: 21"w x 28"h.
High amongst the rocks and ice, a lean and swift gymnast prowls her winter palace, always hungry, always wary. Secure in her treacherous realm, she is the "Ice Princess." Present art that gives people a new perspective on their world and they will react. "Ice Princess" won three of the top awards ¯ the Patrons’ Choice, the Artists’ Choice and the Bob Kuhn Wildlife Award ¯ at the 2014 Masters of the American West show. 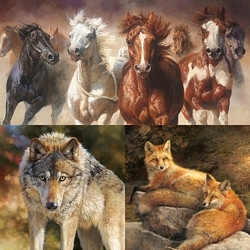 This Fine Art Edition defines what is wild about the wilderness!